Employment verification is a practice of authenticating the employment eligibility and past work history of potential candidates. Employers always verify employees prior to hiring or promoting them to make sure if all information written is legitimate and matches with what the applicants provided. 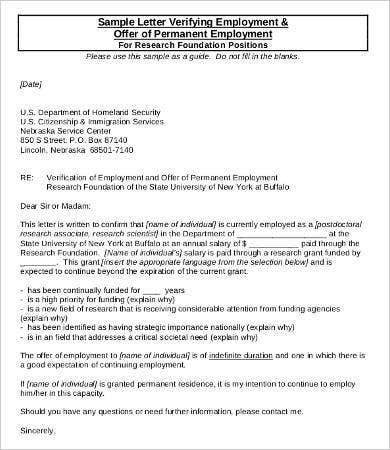 These types of letters are necessary for employers and high-level management. Our gallery showcases a list of employment verification letters that you will surely need, whether now or in the future. If you are looking for this type of letter, then no need to look elsewhere. We have everything you need right here. Take time to check them out. For other more generic samples, check out this collection of Letter Templates on our Web page. 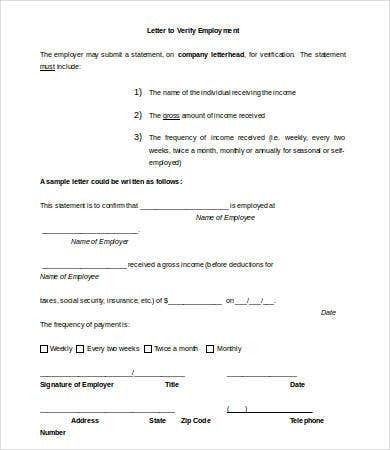 No matter what company it is that you are applying a job for, it is always part of the application process to let you fill out an employment application form and then a verification form. It is also a way for them to verify that what you have written on your documents are the same with what they have. There are surely instances where mismatched information happen, so it is always an imperative to all employers to verify their applicants prior hiring or inviting them to an interview. 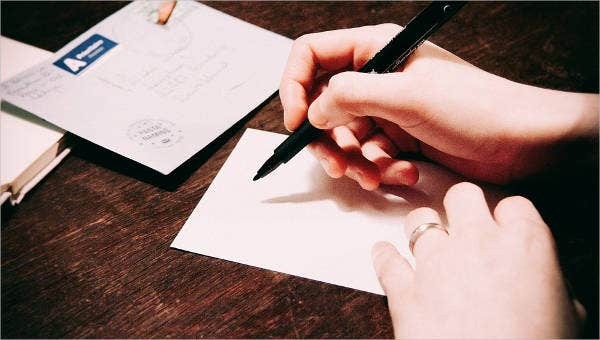 You should follow a business letter format. Include your contact information at the top, the date, and the receiver’s contact details. 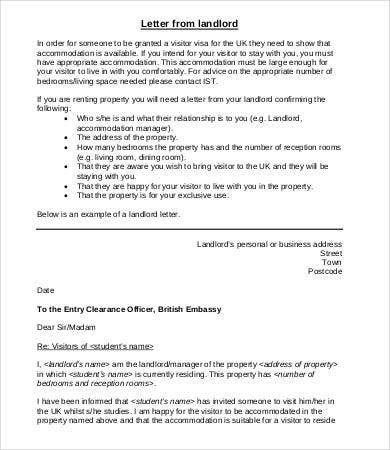 Be mindful of using a salutation and a handwritten signature at the end. Always keep it concise. It should not be lengthy and omit irrelevant information. Include what is only needed. Don’t forget to include all requested details. 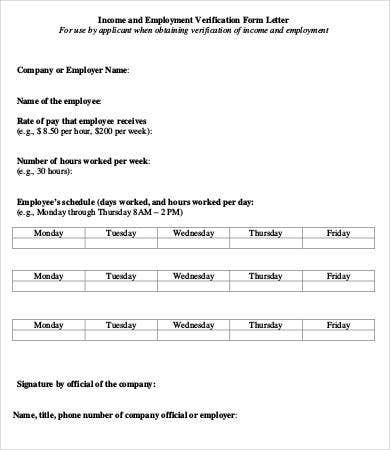 The department head’s name, the name of the department itself, and the length of time the employee has been employed. 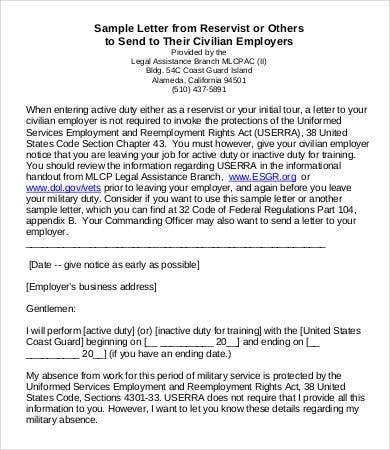 Be sure as well to ask your employee if they need additional data in your Employment Verification Letter. Don’t forget to include your contact information. You can also provide a form of contact for the receiver, such as your e-mail and phone number. These steps are necessary to obtain a smooth and easy recruitment process, not just for employers but also for applicants. An organized step-by-step process is a must. 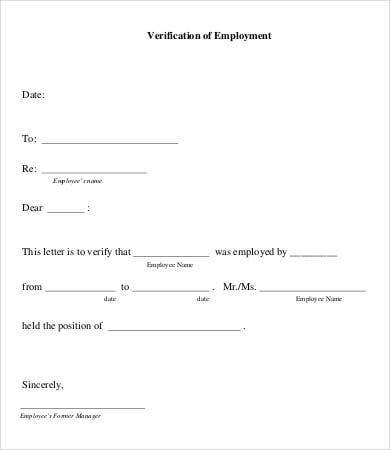 After all the verification is done, a Letter of Employment is needed so you could finally offer the prospective recruit a job in your firm. We completely understand the busy and hectic schedule an employer has, from preparing all necessary forms for a candidate’s application down to checking every detail. Since we do not want you to have a more stressful day, we’ve prepared these 7 letters of employment verification especially for you. Each has its own content to match what you need. These also come in high-quality resolutions for retained image integrity when printing in large-scale material. If there is a need to change the format or add more details, feel free to do so since these samples come in highly editable PDF or Microsoft Word formats. 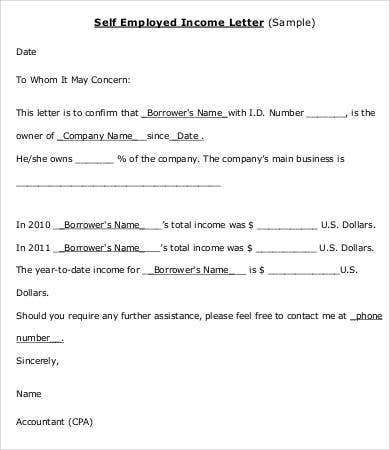 You can download these letter formats straight to your computer or laptop, which you can print after. Share this page with your friends who are also looking for similar samples. They will surely appreciate you for it. Go ahead and utilize all of them. They are all yours. 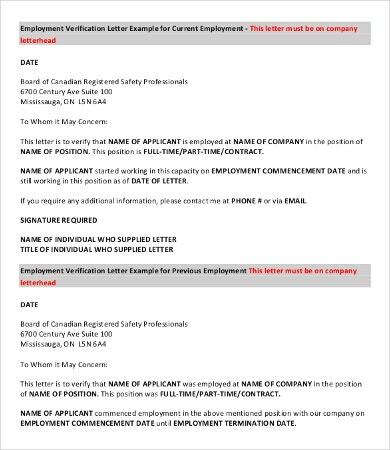 If you’re looking for job letter samples, check out the Offer Letter Templates from our Web page.